This is a safe and leisurely guided bike ride tour to discover the natural beauty and local history of the Port Melbourne area. Learn how Port Melbourne has changed. The ride is flat, easy and suitable for people of all ages and riding ability. Approximately 11.5kms long and 2.5 hours in duration. 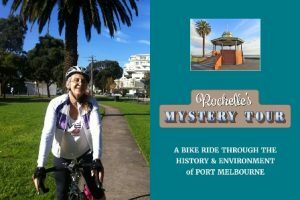 Meet your guide Rochelle at Port Melbourne at the Rotunda on the Bay Trail bike track (88 Beach Street). Bring your own bike or borrow one from the nearby Melbourne Blue Bike Station. Rochelle will guide you around significant sites along the Waterfront and up to West Gate Park one of Melbourne’s hidden gems with views of the Yarra and the city skyline. The ride will then go through the historic Garden City, passing by some iconic Bank Houses, back around to Liardet Street and finishing the ride at Gasworks Park. Please bring a spare tube, water resistance jacket and a bottle of water/refreshments.